Now those of you who haven't gotten your coffin yet should not worry that we will get ahead of you. You will learn from my mistakes. So here is the roof with the outlines/mortar done. This is a good way to get started on this piece because as you stitch the outlines, you can be planning your color combinations for the shingles. 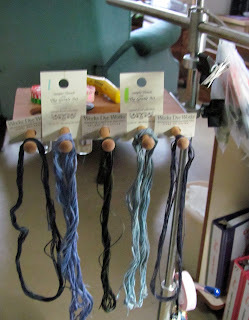 With five different overdyed cotton skeins going at once, one must have a plan. READ ALL THE TIPS BEFORE STARTING. They are great. Yes, she knows what questions you will ask before you do! See my plan for keeping my threads straight as I filled in the shingles. ( I didn't use Amy's suggestion). I thought this was a novel idea. This is how they ended up by the time I was finished with the shingles. So much for novel ideas. Another idea is to use a labeled Needle Park Avenue. I will share my shingles with you next week. 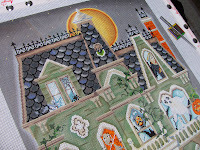 The enforced entrapment of the snow and ice in Memphis has given me the perfect excuse to stitch on the Haunted House. I have finished the stone arches over the windows and am starting on the slats of the balustrade. The challenge of stitching old, dirty, broken, stonework has been interesting. Normally when we look at threads to pull for areas on a canvas we aren't looking for that description. The combination of the woven stitches that I have finally settled on and the rough texture of the Wool Crepe has been perfect. Of course, that doesn't mean that I didn't have to stitch it, take it out, stitch it again, take it out again, and then re-stitch it one more time. Just on the slats alone I struggled with width, length, shape, snagging issues, and which part is worked first and which is worked last. The process is much like the same one that everyone else follows, with the added complexity of knowing that you have to describe and diagram every step of the work when you are finished. I love every minute of the journey through each of my needlepoint projects. They all become very personal and I always hate to see them end....although, it is nice to have those finished pieces to enjoy and share. I have received my Haunted House canvas and have taken great care in mounting it on Evertite stretcher bars. If you are new to Evertites, please read the instructions included with the bars. A key to know you are getting it right is that the Evertite logo on each bar should be facing inside. The pictures in the directions are very helpful. It is important to mount the canvas straight horizontally and vertically. So I found the center of each side and matched it with the center line marked on the bars. Make sure the screws are all the way flush with the wood before you start tacking or stapling. Once the canvas is tacked onto the bars, I usually give each screw two or three turns. Keep the tension even by giving each side the same number of turns. I think you will really enjoy the Evertites. When your canvas gets loose, just turn the screws to stretch it out again. Make sure to tighten evenly so you don't get the canvas out of square. So I am ready to begin. 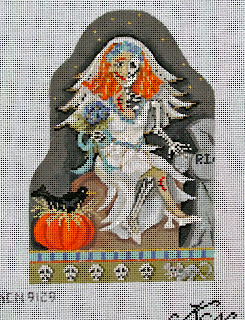 I hope to keep a few steps ahead of those stitching Halloweenies in order to encourage them to stay current. So I will start with the shingles tonight. It is so exciting to finally be starting this Home Study project. I hope you can join us. Hi Everybody... Robin here. I've got some photos for you... Here's the first photo showing my current status of the Kitty Bra & Tap Pants. I finished out the Gold Edge of the Tap Pants with a Vertical Satin stitch using 4 ply of the Gloriana Silk Floss #045 Lacquered Gold. (It was left over from stitching Katt Z. Witch.) Then I did the Madam Stitch using 1 strand of Petite Sparkle Rays PS70. I used more of the Soie Perlee Noir for the Basketweave inside each cup. I did Inline Couching for the Gold Strap and Trim around the top edge of the Kitty Bra. I used Kreinik 1/16" Ribbon 002V for the Strap and Trim; couched with Kreinik size 4 002V. Another name for 002V is "Vintage Gold." 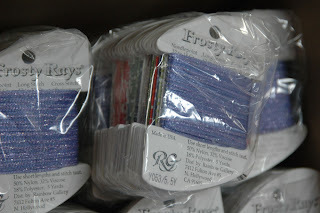 It took me a while to realize the Kreinik Metallics had numbers & names. I used a Chenille Needle to pierce the canvas thread as needed during the Couching procedure. Here's my definition for Inline Couching: the Couched Ribbon is pierced "in a line" by small tacking stitches. You can see with the second photo the piercing of the couched Ribbon. How do you do Madam? Hi Everybody... Robin here. Well, the Tap Pants are done. Let's move on to the Bra. Today I will show you my plans for the "non-kitty face section of the Bra." Geez, what do you call that area? Is there a Foundation Garment expert in the house? Let's just call it the "sparkly cream area" until a better name is given. OK, so I was looking for a stitch... and found the Madam Stitch. 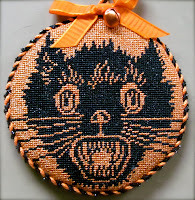 (I'm not talking Heidi Fleiss here, people... this is a respectable needlepoint Blog.) I'm talking about the collection of Gobelin stitches with their own unique pathway... the Madam Stitch. Let's refer to the Chart. At first glance what do you see? A column of Straight Gobelin and then a column of Slanted Gobelin? That might be true, but that's not how you do the Madam Stitch. 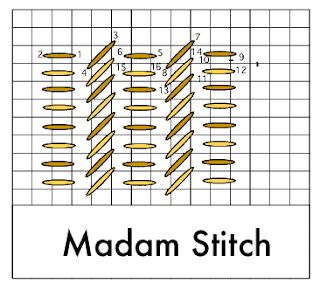 The Madam Stitch is worked in horizontal rows. I did the chart in two-tone colors for easy following. Work a Horizontal row color in the sequence indicated by the pathway numbers. See the 2 small black Pinhead Stitches at the end of the first row? You will need to work one of them, either under your last stitch or outside the stitched area, to properly orientate your thread for the next stitch on Row 2. That's now how you do the Madam Stitch. It looks really cool. Since we are talking about beads... I wanted to share something that was brought back from the TNNA market. It is a kit with lots of different sizes of beads. I really like it except the bead tubes are not labeled. 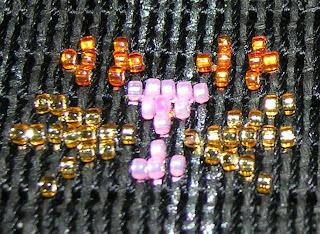 The reason I want to stitch it is to learn more about bead sizes. The kit includes a piece of mono canvas and 13 tubes of beads, a beading needle and a spool of beading thread. Also included is a small amount of off-white thread. I think I would pick an overdyed thread to go with the beads provided. The kit is from Sundance Designs and designed by Cassandra Prescott and Nandra Hotchkiss. I have sent an email to Sundance to see about labeling the bead tubes. 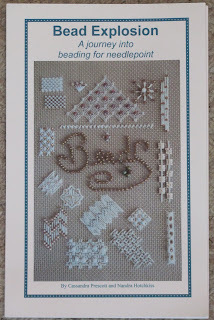 It looks like a good little project for people like Sue and myself, who haven't had much experience with beading. I will update you when I hear back from Sundance. I believe it retails for $21.00. You can read more about this product on Amy's website: Bead Explosion by Sundance. Hi Everybody. Robin here... I wanted to mention my technique for beading the Kitty Faces on the Tap Pants. I decided I wanted the beads to sit vertically... not their usual diagonal angle. 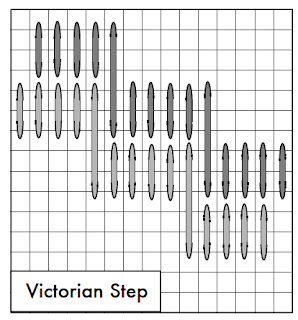 I felt this would enhance the vertical flow of the Victorian Step stitch. I am learning different beading techniques, so if there is already a name for this technique, please pass it along. I used Invisible Beading Thread for each of the size 14˚ Sundance beads. Some people have issues with Invisible Beading Thread... I don't... I love it. But, certainly you could use Black Beading Thread. 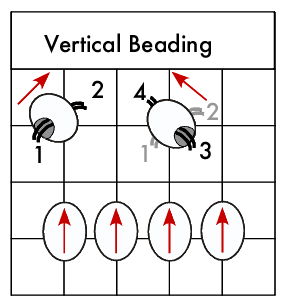 Each bead was anchored by a double stranded X, going through the bead (first from California to Maine; then from Florida to Seattle) instead of the Lasso Technique. Anywhoo... that's what I did. And here's a close-up photo so show you what it looks like. All beads lined up vertically and securely fastened. Hi Everybody... Robin here. 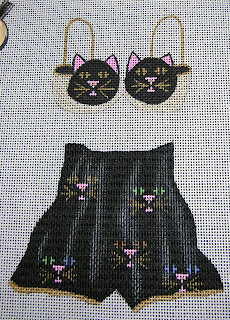 I've selected my size 14˚ Sundance Beads for the Kitty faces on the Tap Pants. You can see the colors match pretty nice. I will be using Invisible Beading Thread, too. You asked for them, and here they are! Here are the "little coffins", waiting for their final items before shipment at the end of the week. 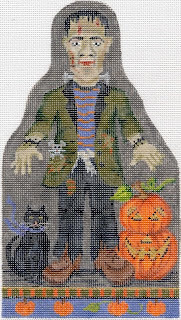 They will contain the Haunted House canvas, a stitch guide for about 25% of the canvas, and a thread kit. This represents many hours of work. Kelly Clark designed and painted the canvas. Amy Bunger composed a stitch guide and stitched the canvas. Then Jill and others made lists and ordered the threads and stretcher bars. 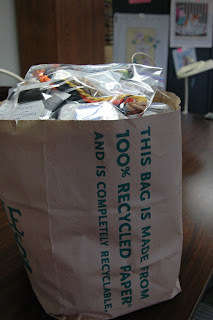 Here they are with most of the supplies and everyones order form inside. Jill is VERY organized. And there are a couple of little surprises in the box for each recipient as well. It won't be long now. Hi Everybody. Robin here... The pondering has begun. Question: How to keep true to the wonderfully painted SharonG canvas, and yet, put my own spin to it? The Tap Pants have nicely painted silver highlights conveying the flowing fabric. I tried several different stitches & threads, but realized the stitched silver highlights were trying to steal the show. My Solution: I decided to use a Barely There approach. (Shameless plug: DVD #6, Barely There.) For the black Tap Pants, I used 1 strand Soie Perlee Noir and the previously diagrammed "Victorian Step." This vertical stitch allows the painted canvas silver highlights to shine through; a nice effect. An apology to the readers: Looks like I've entered a Bermuda Triangle vortex: Barely There technique, Black Paint and Black thread. Oops, I just realized this might be hard to see. So sorry. Things will start to pick up... Hang with me, if you can. Hi Everybody. Robin here... I'm going to be your "warm up act" until the Halloweenies Haunted House takes front & center stage. Welcome to "Improv Night with Robin." Jane/Chilly Hollow has begun a new needlepoint project: her "Camouflage Bra & Tap Pants" by SharonG... which got me thinking... I've got a Bra & Tap Pants by SharonG, too. I looked through my stash, and there it was... the Kitty Bra & Tap Pants. (You knew it would either have a Cat theme or a Halloween, didn't you! I am nothing, but consistent.) Then I said, "I want to stitch along with Jane!" The canvas was already on stretcher bars and a nice collection of threads were already in the bag. 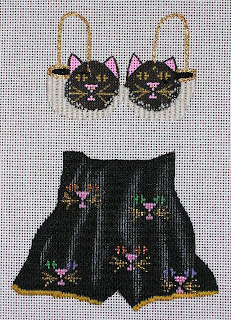 So, after daily obligations are met, I will treat myself (and you) to stitching the Kitty Bra & Tap Pants. This will be fun, and kudos to Jane/Chilly Hollow, enabler-extraordinaire! Jill has all of the Haunted House canvases in boxes. Because most people are getting the Evertite bars with the canvas Jill is using long skinny boxes with black tissue paper. So Amy's classroom appears to be full of little coffins! I'll get a picture of them on Monday. Also, the Bride Z Illa canvas arrived today from Kelly Clark. So Amy put yet another Halloweenie on the rack, (stretcher bars). This bride is half human and half bones. Can't wait to see her dress! Hello. I had hoped to be blogging about Katt Z. Witch by now, but her arrival date has been pushed back. So I thought I would share an ornament I stitched some time ago. It is from Point of it all. Isn't he cute? I've used this time without Katt Z. Witch to actually finish two, yes two projects. They are both Santas, and they have been sent off to the finishers. I will share them with you when they come back. I 'm counting down the days till the Haunted House canvas arrives. There is a very short thread list for part one of the house, and they are all over-dyed. 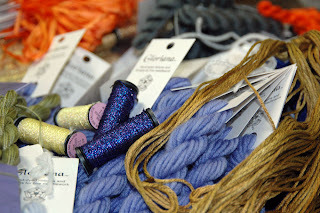 Included is a wonderful over-dyed thread from Gloriana called Lorikeet. Lorikeet is a 9 stranded wool which can be hard to strip. Amy will share a tip to avoid that tangled mess that can happen when stranding Lorikeet. We will talk about it when we get to that area on the front of the house. Actually the stitch guide is chalked full of tips. They are often general stitching tips that will help you with this project as well as help you to develop good stitching habits. Here is a good one. 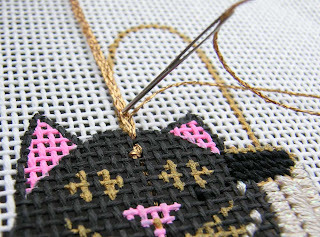 Start this project with a new pack of needles. Hi Everybody, it's Robin again. Finally got my things unpacked and put away from the wonderful trip to Long Beach, CA. I miss my Badge. The Badge Holder is your identification which you wear around your neck during all TNNA events. It tells your name and where you are from. Retailer versus Wholesaler, etc... It's funny when you first meet people: their eyes quickly glance to the Badge and scan the info. Then they look at your face. We all do it. That's the beauty of the Badge. No need to panic if you don't remember a name! 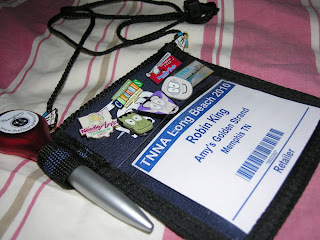 I first received my Badge Holder in 2007 at the TNNA June Columbus Market. The styles have changed since then; however, the concept is still the same. It measures about 5" W x 5½" H, and has a long adjustable lanyard to wear around your neck. There's a Zipper across the top revealing a full inside pocket: great for storing business cards, cash, pens... you name it! And my Badge has a pen holder, as well as a 2nd clear window pocket on the back which was great for holding the Hotel room key, reminder notes, and gum. My Badge Holder did everything that my Purse could do... being streamlined, of course. My Arms and Shoulders were free! At each TNNA Market they also give you a commemorative Pin featuring the location & year. Your collection shows how many Markets you have attended. I proudly have 3 Columbus Pins and 1 Long Beach Pin. The other Pins you see were from Just Another Button Company. 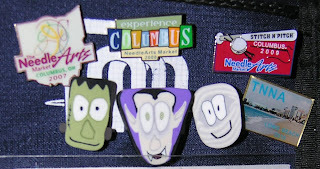 In Columbus/June 2009 JABC was giving away these Halloween Pins... a great marketing tool to introduce their newest Buttons. Since these were of the Halloween theme, and you know I love Halloween... I circled like a Buzzard during the show snagging all 3 Pins. Thank you, JABC, for a great Trio. I am home now, and back to using my purse. Geez, it weighs a lot. Just made it back from the TNNA 2010 Winter Market. 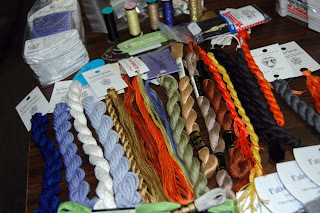 I need to unpack, but will soon share my experience in the Needlepoint Study Hall Blog. Katt Z. Witch was a hit! She handled her first cross-country flight like a pro. She toured the event and was introduced to the "Rock Stars of Needlepoint." Here's a photo of Katt Z. Witch. 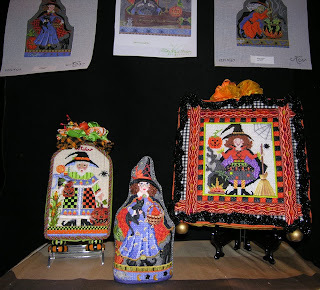 She was on display in the Kelly Clark Needlepoint booth during the Market. You can see her painted canvas in the upper left corner of this photo. Just wanted to check in & let you know: we did survived! The Long Beach market is over. Amy, Jill and Robin will be headed home tomorrow. We didn't get any blog news from them because they didn't have a good internet hook up. But they promise to fill us in on who they met and what they bought. I understand that they had to spend some time keeping Dr. Acula out of the local bars at night. And Stirha Cal-Dron and Frank N. Stein were rumored to spend lots of time at the beach. Stirha was looking for good seaweed for some spell she is working on. She needs to get the brew right before we stitch her in March. Frank is such a good sport about lugging the seaweed home in his luggage. I don't think he realizes that there will be an extra luggage fee. I got a good look at the Haunted House canvas today, as well as the pictures that will come with the first kit. All I can say is get out your laying tool. The walls are going up. Amy, Robin and Jill are heading to market. Robin will teach and Jill will shop. Amy reports on the Halloweenies characters who are joining them on their trip. I think they are going to audition some new threads that Amy will look for at TNNA market. Kelly Clark and Amy have come up with some new twists on old scary names. This will be a fun journey for everyone. I can’t believe we have a whole month to wait until the Halloweenies Haunted House canvas arrives at our doorsteps. Of some consolation is the availablilty of the Kelly Clark designed Katt Z. Witch canvas in mid Janurary. It fits right in with the house and characters to come in the Halloweenies Home Study program. Robin King will be teaching a class with Katt Z. at TNNA Market on Friday. The canvas along with Robin’s stitchguide will then be available to us. Maybe we can get started on that. In the meantime, I already have my stretcher bars ready for the Haunted House. It is a large canvas so I plan to use Evertite Stretcher Bars. This canvas will be on bars for at least a year (or more), so the canvas may loosen up as the seasons change. Evertites are thick wooden bars with a built in stretcher mechanism. 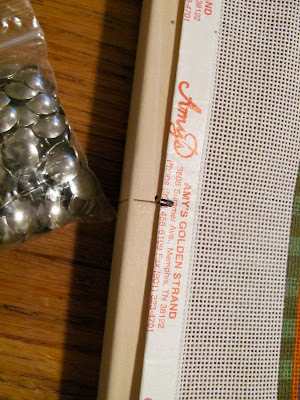 If you mount your canvas straight and tight to begin with, all you have to do to restretch your loose canvas is titen the screws in each end of each bar. The Chilly Hollow Adventure has an excellent review of them. http://chillyhollownp.blogspot.com/2009/11/evertites-review.html Thank you Jane. Evertites are the best way to keep your canvas as tite as a drum without ever having to remount the canvas. It can take 30 minutes to untack and then restretch a canvas of this size. That’s a loss of valuable stitching time! If you thought you would stitch the Haunted House on a scroll frame you may want to reconsider. I can tell you that Amy Bunger has planned some interesting dimentional stitches for the Haunted House and it will not work very well to roll it up on a scroll bar. It would be better to work at a table with a frame weight holding your framed canvas steady. That also leaves both of your hands free to tackle those decorative stitchs. This might take some getting use to, but in the end you will have a better Haunted House. I believe most of the people who have signed up for the Halloweenies Home Study have requested Evertites be sent to them along with the Haunted House canvas. If you have never used them, please read the directions carefully before you put the bars together and attach your canvas. It is not as straightforward as you would think. But it is not that difficult either. Stay tuned for news from Robin about her class at the TNNA market this weekend. Can’t wait. Yesterday was 12-31-09. While the Revelers were poised for their big blow-out, I shared in a celebration of sorts... the kitting of the Katt Z. Witch Thread Kits. I had received all of the donated threads for the Sold OUT class of 20, and it was time to put them into their individual bundles. I had an excellent teacher/guru to help me: Jill from Amy's Golden Strand. Jill is the Manager of Amy's Home Studies, and boy, does she knows how to kit! 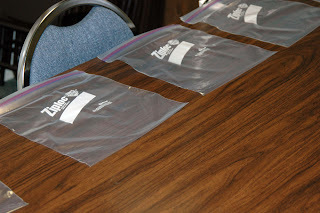 First step... lay out the 20 Ziploc Gallon-size bags on the tables, creating 20 different stations. 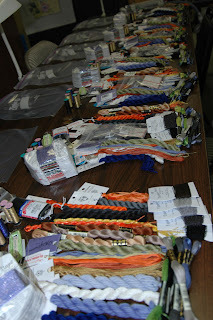 All of the donated Threads are spread out on a nearby table; waiting their turn. This bundle from Rainbow Gallery is awesome. They had agreed to donate their threads for the class, and packaged the needed quantities onto these special product cards. When I opened the box, I shouted with glee: Perfect bundles of joyous threads. What a company! Round and round I went. Dropping off 1 thread type at each station, counting all the way. Making sure there were 20 total, and only one per station. 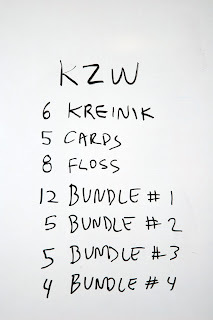 This is what I refer to as the "Wilensky Method of Kitting." Here is the close up of one kit. Threads from companies including Gloriana Threads, Week Dye Works, The Thread Gatherer, Caron Collection, Sundance, Rainbow Gallery, Kreinik, YLI, Wichelt/Mill Hill, Vineyard Silk/Wiltex Threads, DMC, Burmilana/Amy's Keeping Me in Stitches, Fabulous Fibers & Embellishments, Dream House Ventures, Renaissance Designs, and Colonial Needle Company. Graciously all donated! Unbelievable! How wonderful is that! I will go to each Company at the TNNA Market, and personally thank them. I will also show off Katt Z. Witch so they can see how fabulous their fibers worked. If it looks like a lot of threads... well, it is. But actually, what else could I do? After all, I was working with a beautifully painted canvas by Kelly Clark Needlepoint. Then Jill showed me her Counting Method. Make a note about how many threads are to be in each kit. If that's a large number, she said to break things down by shape or thread type into smaller bundles. Once all threads were placed, I made my master counting plan.